St Luke’s Parish House shelter in Seaford is closed this evening, 2/27/2016. Our guests are encouraged to meet at Davelli’s on Stein Hwy, next to the A.C.E. Center, at 6:30pm to be transported to Laurel Nazarene. Dinner will be at Laurel Nazarene. Notices will be posted at St. Luke’s with the hot-line number in case of anyone needing shelter, after transport. Please, if you know of any one needing shelter this evening please encourage them to call the hot-line at 302-519-0024. Code Purple NOT active 2/28-3/1. Due to the increase in temps above 32 for Sunday, Monday, and Tuesday night, Code Purple will not be in effect for those nights. We will update accordingly if the weather changes. We will be sending them out with food to-go. If you would like to contribute to these to-go bags please see our donation list for specific items that are packed in these gallon zip-lock bags. Thank-you all for your continued support! Code Purple Activated til Saturday 2/27. Code Purple Sussex County is activated until Saturday, February 27th, 2016. The rain and severe thunderstorm forecast for the 23rd and 24th were the determining factors for opening the shelter on nights when the temps are slightly elevated. Anyone experiencing homelessness is encouraged to call the hot-line at 302-519-0024. St. Luke’s Parish House, 202 N. North St. Seaford, DE 19973. Please use the double door entrance on King Street. Intake is at 7:00pm followed by dinner. Call Nikki Gonzalez at 302-519-0024. Laurel Nazarene is located at 94 Walnut Drive, Laurel, DE 19956. Men only. Intake is at 7:00pm followed by dinner. This shelter is closed on Wednesdays. Call Nikki Gonzalez at 302-519-0024. Gateway Fellowship is located at 8110 Cannon RD, Bridgeville, DE 19933. Women and children only. Women meet at St. Luke’s Parish House first for dinner. They are then transported at 8:30 to Gateway for the night. If you miss transport at 8:30, then you must find transportation to Gateway. Call Nikki Gonzalez at 302-519-0024. Grace Baptist is located at 805 Atlanta Road, Seaford, DE. This shelter will be open on Wednesdays & Thursdays as an overflow or relief shelter if the low is forecasted to be at or below 32 ° the sanctuary opens for emergency shelter for the homeless. Advance notice will be given when this shelter is in use. Women and men will meet here for in-take at 7pm, eat dinner, and then the women will be transported to Gateway Fellowship to stay overnight. Call Nikki Gonzalez at 302-519-0024. Mount Olivet UMC: Seaford, Call Nikki Gonzalez at 302-519-0024, or go to St. Luke’s for check in at 7 PM. Mt. Olivet will open for full intact families that are in need of shelter. Weekend Day Shelter: Centenary UMC, 200 E Market Street, Laurel, DE. When the lows during the daytime are 32* or below this shelter will open at 7am till 7pm for the homeless. Serving a hot lunch. Call Nikki Gonzalez at 302-519-0024. Georgetown Presbyterian: Call Pastor Mike at 302-344-1912 or leave a message at the Church 302-856-6842. This sanctuary is open for extreme weather and not held a certain temperature. Must call ahead. Milford Multicultural Center: Milford, Sanctuary for women and children only. Executive Director, Lisa Davis operates this shelter and can be contacted by either Kent County Hot-line or you may call the center at 302-725-0770. Eastern Sussex: Eastern is unique as they operate cold weather month’s shelter. Their shelters are open and will remain open until spring regardless of the temperature. Soul Ministry: Bethany Beach 302-632-4289. Sanctuary operates daily for men with support from South East Ministirium. Code Purple Sussex County is activate for Tuesday, February 23rd, 2016. We will be reviewing the weather closely due to the storms coming in for Wednesday and will release an updated activation shortly. Anyone experiencing homelessness is encouraged to call the hot-line at 302-519-0024. St. Luke’s Parish House, 202 N North Street, Seaford, DE 19973. Please use the double door entrance on King Street. If the low is forecasted to be at or below 32 ° the sanctuary opens for emergency shelter for the homeless. Homeless come at 7 PM for intake. Call Nikki Gonzalez at 302-519-0024. Laurel Nazarene is located at 94 Walnut Drive, Laurel, DE 19956 – if the low is forecasted to be at or below 32* the sanctuary will open for emergency shelter for the homeless. Men Only. Homeless come at 7 PM for intake. This shelter is closed on Wednesdays. Call Nikki Gonzalez at 302-519-0024. Gateway Fellowship is located at 8110 Cannon Road, Bridgeville, DE 19933. Women and children only. If the low is forecasted to be at or below 32 ° the sanctuary opens for emergency shelter for the homeless. Women meet at St. Luke’s Parish House first, eat dinner, and then transport to Gateway to stay overnight. Call Nikki Gonzalez at 302-519-0024. Grace Baptist is located at 805 Atlanta Road, Seaford, DE. Call Nikki Gonzalez at 302-519-0024. This shelter will be open on Wednesdays & Thursdays as an overflow or relief shelter if the low is forecasted to be at or below 32 ° the sanctuary opens for emergency shelter for the homeless. Advance notice will be given when this shelter is in use. Women and men will meet here for in-take at 7pm, eat dinner, and then the women will be transported to Gateway Fellowship to stay overnight. Call Nikki Gonzalez at 302-519-0024. Milford Multicultural Center: Milford, Sanctuary for women and children only. Executive Director, Lisa Davis operates this shelter and can be contacted by either Sussex County Hot-line or Kent County Hot-line or you may call the center at 302-725-0770. Soul Ministry: Bethany Beach 302-632-4289. Sanctuary operates daily for men and women with support from South East Ministirum. Centenary UMC, 200 Market Street, Laurel, DE; will be open Saturday 2/13 and Sunday 2/14 from 7 AM to 6 PM. Transportation will be provided to Centenary from St. Luke’s at 7:45 AM on Saturday and Sunday mornings. Transportation will be provided from Centenary to Laurel Nazarene at 6 PM on Saturday 2/13. We will have dinner at Laurel Nazarene and then transport to St. Luke’s at 8:45 PM on Saturday. Transportation will be provided from Centenary to St. Luke’s at 6 PM on Sunday evening. St. Luke’s Parish House, 202 N North Street, Seaford, DE. Use the double door entrance on King Street. If the low is forecasted to be at or below 32 ° the sanctuary opens for emergency shelter for the homeless. Homeless come at 7 PM for intake. Laurel Nazarene is located at 94 Walnut Drive, Laurel, DE 19956 – if the low is forecasted to be at or below 32* the sanctuary will open for emergency shelter for the homeless. Men Only. Homeless come at 7 PM for intake. This shelter is closed on Wednesdays. Gateway Fellowship: Bridgeville, Call Nikki Gonzalez at 302-519-0024. 8110 Cannon Road, Bridgeville, DE 19933. Women and children only. If the low is forecasted to be at or below 32 ° the sanctuary opens for emergency shelter for the homeless. Women meet at St. Luke’s first, eat dinner, and then transport to Gateway to stay overnight. 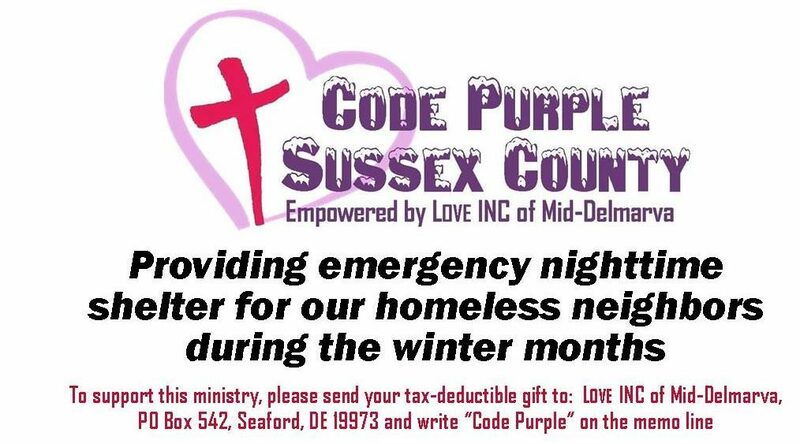 Code Purple Sussex County is activated till Sunday, February 19th, 2016. Anyone experiencing homelessness is encouraged to call Nikki at 302-519-0024. Gateway Fellowship: Bridgeville, Call Nikki Gonzalez at 302-519-0024. 8110 Cannon Road, Bridgeville, DE 19933. Women and children only. If the low is forecasted to be at or below 32 ° the sanctuary opens for emergency shelter for the homeless. Women meet at Pathway Shelter first, eat dinner, and then transport to Gateway to stay overnight. Mount Olivet UMC: Seaford, Call Nikki Gonzalez at 302-519-0024, or go to Stein HWY COG for check in at 7 PM. Mt. Olivet will open for full intact families that are in need of shelter. Code Purple Sussex County is activated till Sunday, February 14th, 2016. Anyone experiencing homelessness is encouraged to call Nikki at 302-519-0024.